Today’s post is a tiny departure from the norm. Since you’ve followed my Halloween preparations throughout October, I wanted to share details from our action-packed day. Here we go. I woke up without an alarm to overcast skies. Rain in the forecast. Super excited, except that it’s Halloween. 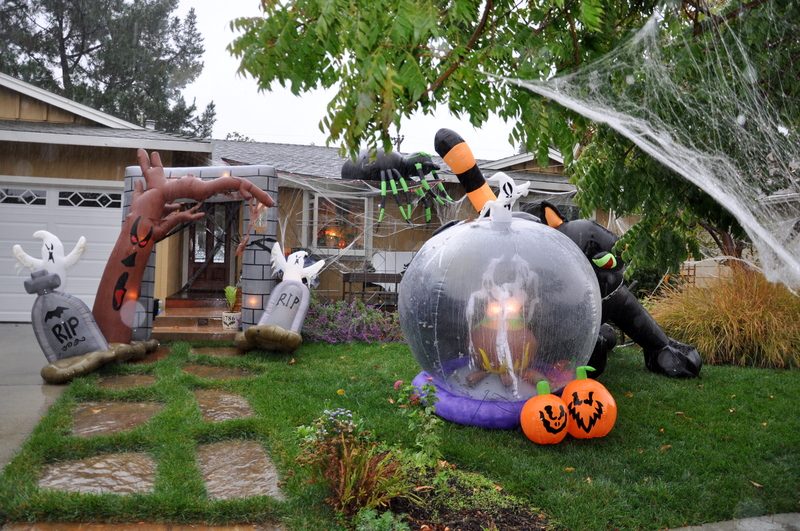 Hopefully it will rain before and after the candy gatherers come out to play. Carpool three teens to school. Wait for the school parking lot traffic to clear.Read a few of my favorite blogs. Leave a long comment on Pauline’s fabulous garden post (one of my favorite subjects of course) but apparently never hit the ‘post’ key. I’ll head back there today, trying to recapture in detail how much I love her garden and her post. Tidy the kitchen and start some laundry. I live a glamorous life. Under strict instructions from my youngest son, I remove all items from the deck. The fairy garden isn’t scary enough. 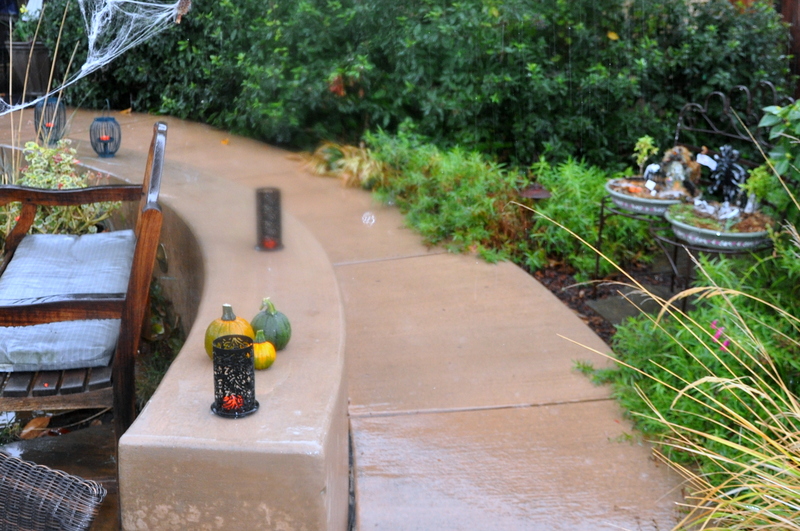 Line the walkway with pumpkins, candles and the aforementioned fairy garden. Inside, Mike guts three pumpkins and decides what to carve. He traveled the day before, up at 4:00 am and home at 10 so he’s tired. Lindy offers moral support. Mike chooses three of his pattern favorites. The skies open up. Puddles form. Honest to goodness rain in San Jose. Giddy with excitement, but still hoping it stops by 5:00 pm. Go out to brunch with Mike, an incredibly rare treat on his day off from work. Well, someone has to fold the laundry. Gather the teens from school. It’s still raining so my youngest son is indecisive about hanging black plastic on the deck awning. He waits. Pick up a self-bake pizza, narrowly avoiding a car accident in the process. To my tremendous surprise, the driver follows me into the pizza place and apologizes! Life is good. Note: Halloween is the biggest take-out pizza day of the year. Back home, I review college application materials with my oldest son. UC applications open November 1st. He’s ready to go. It’s now or never. With Mike’s help, my youngest son covers the awning and sides of the deck with heavy black plastic, saved from year to year for this purpose. 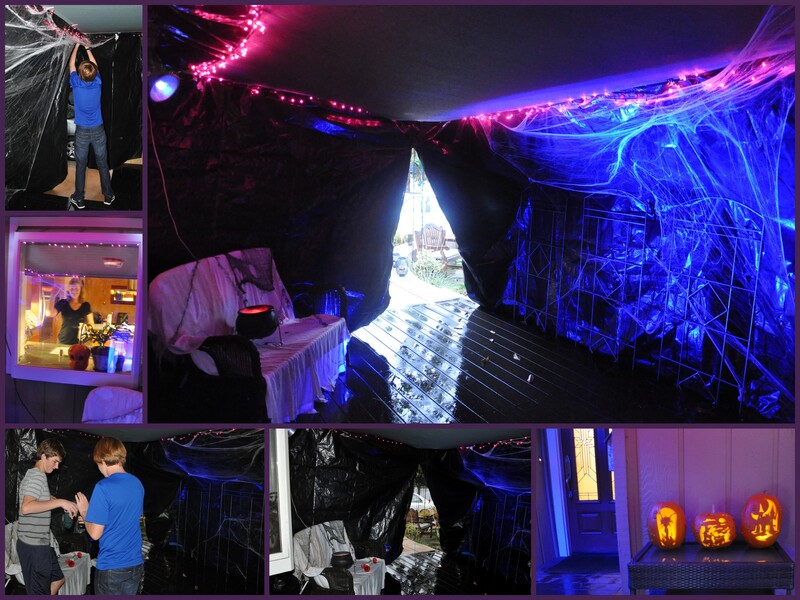 His friend arrives around 5:00 and they scope out hiding places, adding black lights and string. The boys ready their masks. I repeat firm instructions: they’re not to scare anyone under the age of 14. Race down the hall to get ready for the second of three Halloween parties. The boys man the door as the trick or treating begins in earnest. Attaching the false eyelashes is always the trickiest part for me. I don’t wear much makeup throughout the year, so I’m always out of practice. Dressed and ready to go, I continue passing out little bags of pretzels. 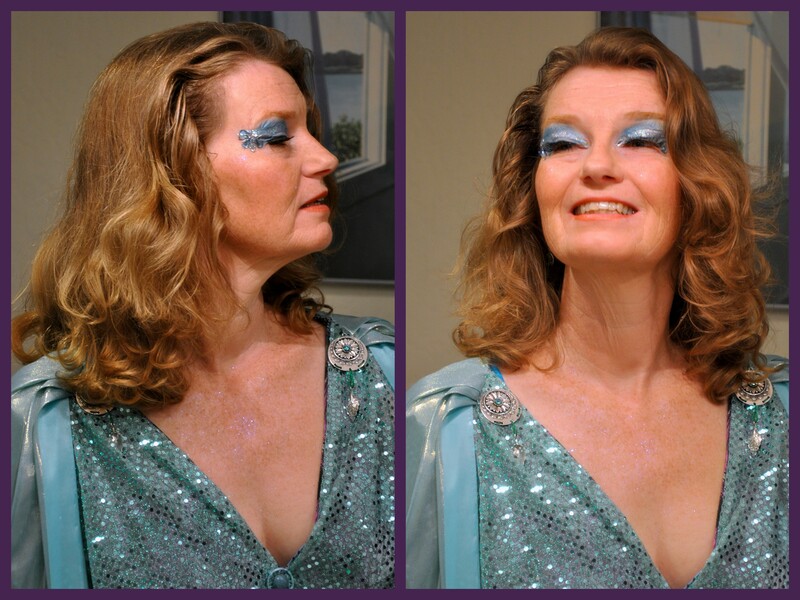 Most of the little girls at the door ask if I’m Elsa from Frozen. I nod and said yes. I was going to make bookmarks to go with them. When did I think I was going to find the time? Next year? We’ve passed out all the pretzels, a box of gummy candy, packets of cookies and granola bars from our pantry and anything else we can think of. 240 bags and buckets have passed by our door. The supply of acceptable give-away treats depleted, we post a note of apology and close up shop. Walk through a cool mist to Lisa and Roy’s Halloween party a few blocks away. Eat. Socialize. Try really hard not to drift off in the comfy chair. At this point I am so tired that I’ve lost track of time. I manage to remove my makeup before crawling into bed, though briefly considered sleeping with it on. Yes, I was that tired. Drift off, patting myself on the back for finishing off my no-candy countdown. If you’re still here, thanks for reading. Today I’m readying our garage for voting tomorrow. Friends in the States, don’t forget to vote November 4th. This entry was posted in Halloween and tagged carving pumpkins, Cats, Halloween, halloween 2014, Halloween party, October 31st. Bookmark the permalink. ← A Fairy Garden Boo! 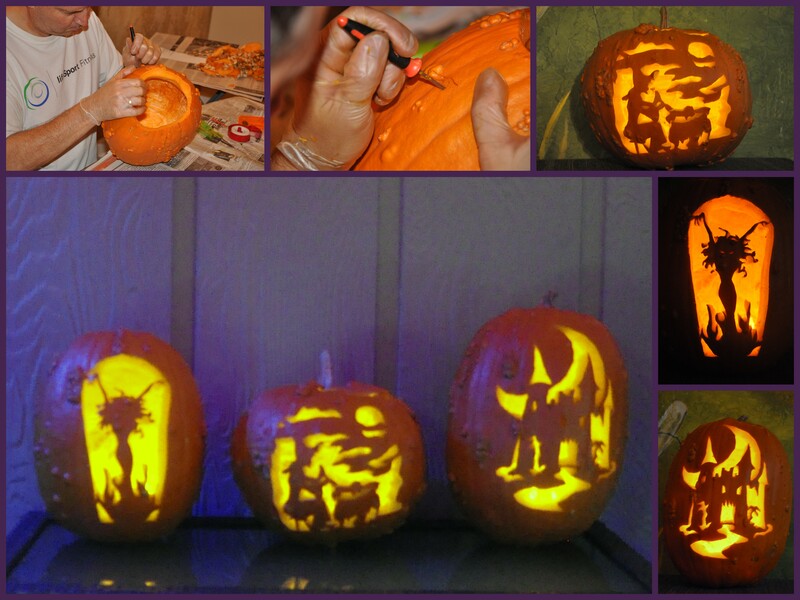 You guys have some crazy talent – those pumpkins are awesome! My Stars! Mike’s pumpkins are works of art. He should quit work immediately and become a full time pumpkin engraver 🙂 Them’s not just carved pumpkins or jack’o’lanterns – them’s ART!! What a day you had! I particularly smiled at 5:15 and 5:17 🙂 And again at ‘I repeat firm instructions: they’re not to scare anyone under the age of 14’. Well, at least one teenager was fully involved in the evening! And to top off a perfectly wonderful Halloween, it rained! I hope it rains some more for you. I so enjoyed following this through this month with you – I have such an appreciation for how Halloween should be celebrated now and what it means to families and communities. I will be sure to tell him you said so, Pauline. 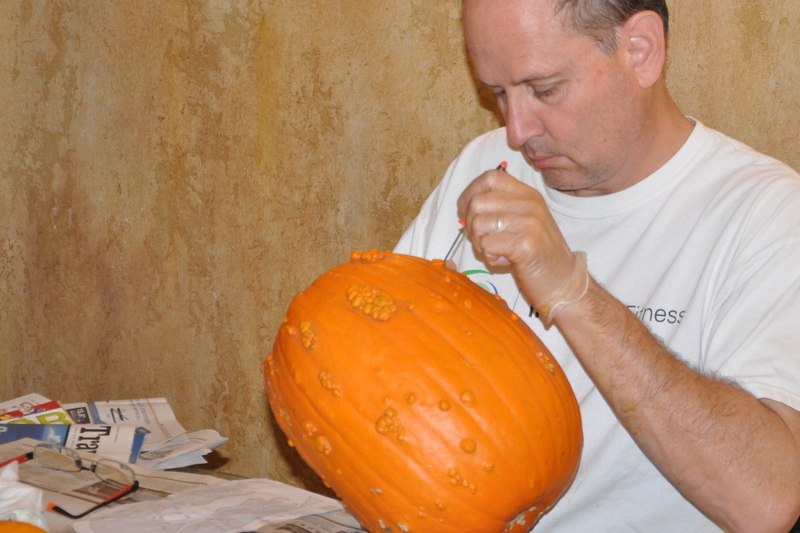 He puts a lot of time and effort into those pumpkins. I’m always amazed with what he can do with a gourd. 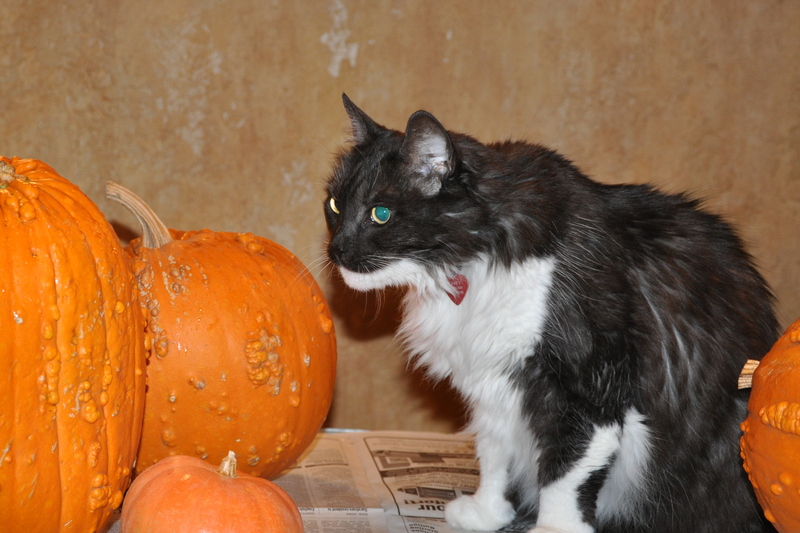 He found the warty pumpkins a bit challenging. They were dry and hard with very few seeds. 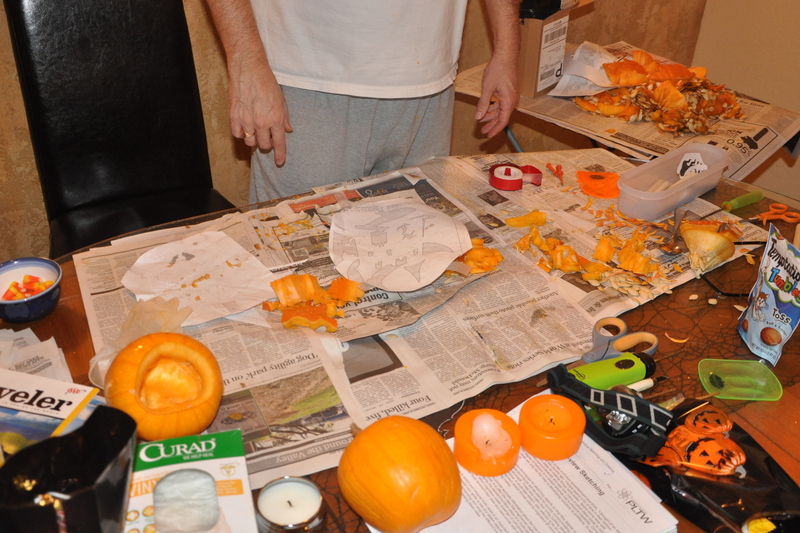 Next year we’ll plan earlier so we can pick up the typical carving variety. 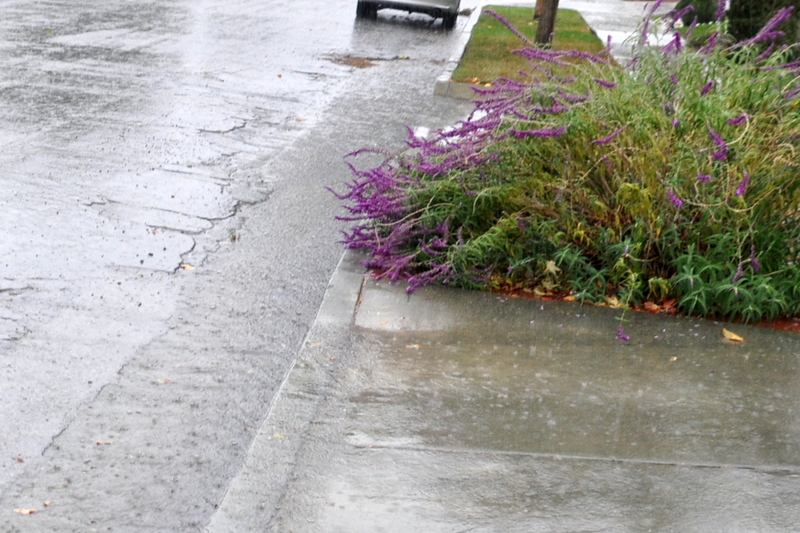 Yes, rain on Halloween with a nice break in the early evening hours was just about perfect. We’ve got another week of above-season temps. Maybe next week. We had about 100 voters at our polling place by mid afternoon, but many more cam by with absentee ballots which now makes up at least 60% of the votes. The polls close at 8 and then results will slowly trickle in. It’s a midterm election, so we voted for governor of the state and for mayor of San Jose along with a few ballot initiatives. LOL on the flying pig. Sweet Cheeses, I’m winded just reading about your day. You do take on a lot and seemingly execute brilliantly even when met with a rainy challenge. But it’s **Rain** !! Wow, that’s just fabulous, look at those roadside rivers. I bet your garden is happy! I’m happy for the wildlife in the nearby reserve lands too. I laughed at the bookmark comment. Gads! You also almost doubled our tricker-treater’s, 240???? That’s banana’s. Thank goodness for the guys helping at the door. We had a small amount of minibars left, which I took to work and Jim’s enjoying the odd one at home. I actually had a rare treat last night. I was craving sugar and ate a mini Wonder bar in one bit. It wasn’t even that good? I just don’t get the whole chocolate thing I guess. Big HIGH-5 for resisting the treats all month Alys. I’m really proud of you and how you’re sticking to your program. You’ve been extraordinary busy yourself, though it all looks and sounds like fun. Here is my problem: my mind says 22 and my body says 55. Ha! You can only ignore the reality for so long. I envy you your lack of interest in chocolate. Just seeing the word makes my mouth water. But, I’m staying strong. No sense giving it up for one month, only to dive in on a binge, right? I’m not saying I will never eat it again, but I’m losing weight and keeping it out of the house, so, so far so good. I’m down 13 pounds since September 1st. Slow and steady. I’m taking a deep breath for you, now another. I don’t think you had time. I swear I could smell the rain as I scrolled down to the picture. We got some down here in S. Ca. Now the Santa Ana’s are drying everything out again.You do manage to tickle my funny bone with how long it took to eat that pizza. And oh my goodness, one son ready for college. Wait till you start talking to him about his retirement plans. 🙂 Life is so funny. Your pumpkins are out of this world wonderful. Art is art whatever medium you use. Mike uses pumpkins and makes beautiful art. 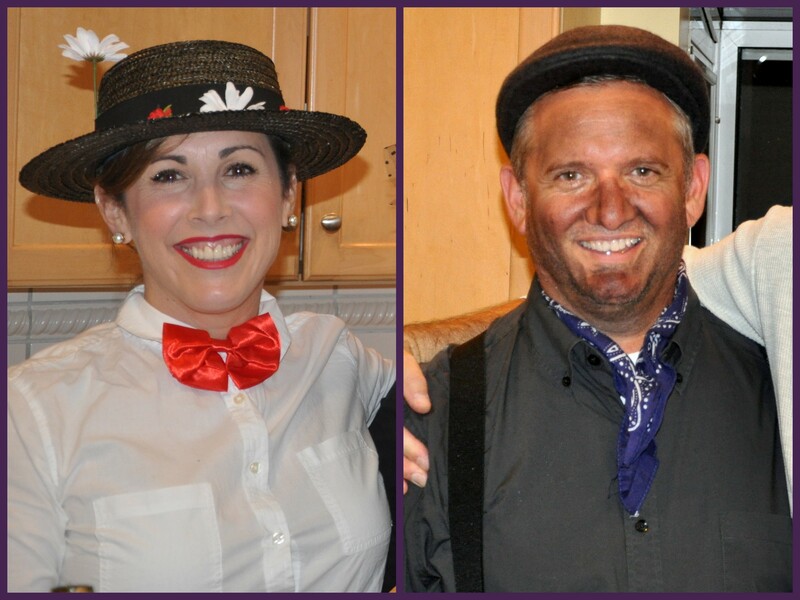 Glad you all had a wonderful Halloween. Hugs. Thank you! I just let out a long exhale with you. I needed that. Doesn’t rain have a wonderful smell? I’m glad to hear SoCal got some too. Any and all rain in this state is welcome. It’s already warming up here too, but fortunately we don’t have the scary Santa Ana winds. Hopefully having some moisture on the ground is a help. I’m always glad when I can tickle your funny bone. Smiling, laughing, chuckling or guffawing are all good for the soul. Yes, one son ready for college. I’m a bit freaked out so may be turning to you for moral support. How do you let them go? I will pass on your kind words to Mike. I know he’ll appreciate it. He does beautiful work. I would never have the patience but I’m so glad he does. One of my all time favorites is still the bunny for a book called Max and Ruby. I’ll have to dig up that photo and share it. Hugs to you, MH. I hope things are going well for you down south. Yes, humor is important. I rarely watch or read anything that doesn’t have humor attached. It’s a great healing tool. You and Miss Aqua both tickle my funny bone so often, I cherish each and every post. A drenching rain AND an apology? It WAS indeed a good day! Yes, an overfull and busy one, too. and despite your fatigue, you looked stunning!! Thank you, Diane! I’m glad you enjoyed it and I appreciate your kind words about my writing. I’ve had so much fun this past month. And now it is already November 5th…and my sister’s birthday. Phew! Sounds exhausting! Hope you enjoyed it anyway after all the excitement leading up to it. Your eye make-up is stunning Alys! Thank you, Cathy! It was a lot of fun, and here it is mid-November and it already feels like a lifetime ago. I hope you have a good week.